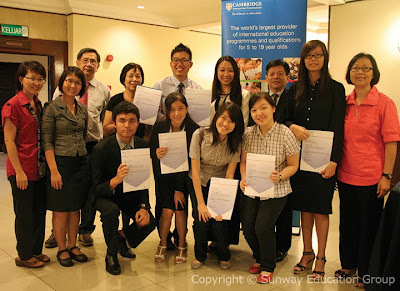 In the CIE A level, Pan Eu Fern received the Top in Malaysia Award for Psychology. All the award winners received their certificates from YB Datuk Mary Yap Kain Ching, Deputy Minister of Education 1 and Ben Schmidt, Regional Director (Asia Pacific) Cambridge International Examinations. Also present at the ceremony was Ng Kim Huat, Senior Schools Development Manager, Malaysia for Cambridge International Examinations. Over a whopping 40% scored straight As in the A and AS levels. For many years running, Sunway A-Level students have done exceptionally well in the Cambridge GCE A-Level examinations. Liew Ziqing, one of the 12 students who scored 4A*s in the November 2012 exams, is currently pursuing his degree in Engineering at the University of Cambridge. Ziqing, a recipient of the Top in Malaysia Award for the CIE AS Level in Mathematics then, represented Malaysia at the International Chemistry Olympiad (IChO) in Russia and won the bronze medal. His trip to Russia was sponsored by the Jeffrey Cheah Foundation. You know how Asia Pacific performance has always been far ahead of its competition? The way you could just tell that internally, Asia Pacific had uncompromising standards for how responsive these things needed to be?